“No nobler men ever touched those Islands, than some of the officers of the American and English navies.” (Richard Armstrong) Admiral Thomas died in Stonehouse, Devon on August 21, 1857. Later, in 1881, the Sacred Hearts Father’s College of Ahuimanu moved from the windward side into the former Rev. Richard Armstrong’s home, “Stonehouse” on 91 Beretania Street adjoining Washington Place. At that time, the name ‘College of St. Louis’ was given to the institution in honor of Bishop Louis Maigret’s patron Saint, Louis IX. By the 1898-1899 school year, there were 247 students in grades 1-8 in the Punahou Preparatory School. Later, in 1902, the Preparatory School was moved to what is now known as the Punahou campus, where it occupied Charles R Bishop Hall. … and what must ever be its outward expression and embodiment,–the kingdom of Christ visible here on earth, His Mystical Body, the blessed company of all faithful people, His Holy Catholic Church. Two men, John Young and Isaac Davies, the former a Liverpool shipwright, fell into the hands of the chief of Hawaii–one who had an intense wish to raise his people to the level of those strangers who, he saw, were so far beyond himself in the power which superior knowledge always gives. … and when Vancouver, after repeated visits to the islands during several years, finally took leave of them in 1794, he begged the captain to procure teachers from England to instruct his people in the faith of Christ. That unhappily was not a missionary age. It was a time of unreality and spiritual deadness in the Church of England: “the love of many had waxed cold;” and it is not therefore to be wondered at, though sadly to be regretted, that such an opportunity was lost. Had it been seized, how different from the actual one might have been the religious history of the various achipelagoes of the Pacific! After the death of Kamehameha, still in a state of heathenism and unbaptized we find his successor Rihoriho issued an edict abolishing idolatry and the old religion. This met with some opposition; a battle was fought, but victory proved on the side of the reforming party. And it was when the way had been thus remarkably prepared that some Congregationalist Missionaries visited them from the United States of America. They were not permitted to land till the king had assured himself by consultation with Mr. Young that they would speak of the same God and Saviour as the English missionaries, whom they had been in vain expecting for the quarter of a century, which had then elapsed since the petition made to Vancouver. Christianity under this form made rapid progress among the people. Rihoriho and his queen came over to England in the year 1823, and, it will be remembered, died in London. The accounts of his visit mention how the royal party attended the services of Westminster Abbey, with which they were much pleased. … when a system of national education has brought the Hawaiian into a comparatively advanced state of civilization, when, too, Christianity, in the form of Congregationalism or the Roman Church, has become nominally the religion of the islands, the cry for help has again reached our shores, and this time has not boon heard in vain. … how that we have here the first instance of our Reformed Church being invited by an independent sovereign to plant itself in his dominions; how, too, by the formation of this new diocese the only link is supplied which was wanting to make the girdle of her influence encircle the globe. It is, however, rather on the nature and objects of the work to be done, than on its general aspects I ought now to dwell. All who visit the islands bear testimony to the sad want of moral purity among them, no doubt in part due to the licentiousness of European and American sailors and others. … accordingly he has encouraged by all the means in his power the institution of boarding schools for the education of native girls, taking them from home at an early age and raising them by the training of the ladies to a higher appreciation of their dignity as women. The Sisters of the Sacred Heart have opened such schools in connexion with the Roman Church, and defective will be our machinery if no similar provision is made by us for furthering the same object. As an English Mission, it is hoped, we may render valuable aid to the cause of primary education in the islands. It is in contemplation to give a more industrial and practical character to the system pursued in the State Schools, and gradually to bring about a displacement of the Hawaiian for the English tongue throughout the native population. The King says, “The importance of substituting English for Hawaiian schools I have already earnestly recommended and in again bringing the subject under your attention, I would touch upon a matter which I think of equal importance, and that is the raising the standard of elementary education in the Common Schools. The foreigners centred there for the purposes of trade and agriculture, chiefly English and Americans, containing many professedly members of our Reformed Church or others who are willing to unite with her … will have to be tended and fed with Christ’s holy Word and Sacraments. In the national jealousies, too, which usually prevail in a centre of resort such as this–one owing its independence to the forbearance and protection of its more powerful neighbours,–we have reason for care and circumspection. … the co-operation of the English and many of the American residents in preparing for the reception of the mission, the baptism of the Prince of Hawaii, our own beloved Queen standing, by proxy, as the sponsor, with which ceremony the Church will, so to speak, be inaugurated–these are all hopeful signs. … there is indeed reason “to be of good cheer and take courage.” For those loving tokens of interest and sympathy how can I ever be grateful enough? And now, on the eve of departure with those brethren who have thrown in their lot with me, and are devoting themselves to this arduous enterprise, I have to ask you, on their behalf as well as my own, a continuance of your Christian sympathy and your prayers. … yet we would like to see merriment and rejoicing, in those whose spirits are so attuned, exhibit themselves especially on those great Christian occasions so eminently calculated to invite the mind to joy, thanksgiving, and gladness, such as Christmas Day, Easter Sunday, and Ascension Day. We notice that this land is said to have been converted to Christianity … We would like to see Borne of the old-world secular festivals introduced, such as “May Day” for instance, to be celebrated with national sports, jubilee, and bonfires through every village and hamlet in the country. Were this properly taken in hand, it could not fail of the best results. As it now is, the nation, as such, has no festival either religious or social, but gropes in the ashes of the past for some stray ember of a half-forgotten “mele,” which it chaunts with fear and trembling, lest its sound may provoke the ban of the preacher or the rebuke of religious martinet. King Kamehameha IV and Queen Emma were responsible for bringing the Anglican Church to Hawai‘i. This invitation culminated in the consecration of Thomas Nettleship Staley at Lambeth Palace on December 15, 1861 as Bishop of the Missionary Diocese of Honolulu. The first services of the church were held in Honolulu on October 12, 1862, upon their arrival. Initially the church was called the Hawaiian Reformed Catholic Church but the name would change in 1870 to the Anglican Church in Hawai‘i. In 1902 it came under the Episcopal Church of the US. In 1836, Honolulu wasn’t really a city; it was just a large village with only one main street, King Street, and less than 6,000 people – about 500 were white foreigners. It was a major port for whaling ships, and as one writer put it, one of the most “unattractive” places in the world. Emma, the future queen, was born “Emma Naea” in Honolulu on January 2, 1836 to Fanny Kekelaokalani Young, daughter of John Young, King Kamehameha I’s counselor, and Kaʻoanaʻeha, Kamehameha’s niece. Her father was high chief George Naea. As was the custom, she was offered to her mother’s sister, Grace Kamaikui Rooke and her husband, Dr. T.C.B. Rooke as hānai daughter. Unable to have children of their own, the Rookes adopted Emma. Emma grew up speaking both Hawaiian and English, the latter “with a perfect English accent.” She began formal schooling at age 5 in the Chief’s Children’s School, where she was quick and bright in her studies. At age 13, Dr. Rooke hired an English governess, Sarah Rhodes von Pfister, to tutor young Emma. He also encouraged reading from his extensive library. As a writer, he influenced Emma’s interest in reading and books. At 20, Emma became engaged to the king of Hawai‘i, Alexander Liholiho, (Kamehameha IV,) a 22-year-old who had ascended to the throne in 1855. The couple had known each other since childhood. At the engagement party, accusations were made that Emma’s Caucasian blood made her not fit to be the Hawaiian queen, and her lineage was not suitable enough to be Alexander Liholiho’s bride. However, the wedding was held as planned however, and the new queen soon became involved in the business of the kingdom, particularly that of saving the Hawaiian people from extinction. In his first speech as King, Kamehameha IV stated the need for a hospital to treat the native population. Due to introduced diseases, the Hawaiian population had plummeted since the time of Captain Cook’s arrival to 70,000, with extinction a very real possibility. The treasury was empty, so the king and his queen undertook the mission of soliciting enough funds to establish a proper hospital in Honolulu. Within a month, their personal campaign had raised $13,530, almost twice their original goal. To ease her pain, Emma dedicated herself to many worthy causes, among which was organizing a hospital auxiliary of women to help with the ill. She also helped found two schools, St. Andrews Priory in Honolulu and St. Cross on Maui. Her work included the development of St. Andrews Cathedral. She journeyed to England where she and her friend, Queen Victoria, raised $30,000 for the construction or the cathedral. When King Lunalilo died in 1874, Emma became a candidate for the throne (the Kingdom had become a constitutional democracy). Lunalilo had wanted her to succeed him, but he failed to make the legal pronouncement before he died. An election for a new sovereign was held. 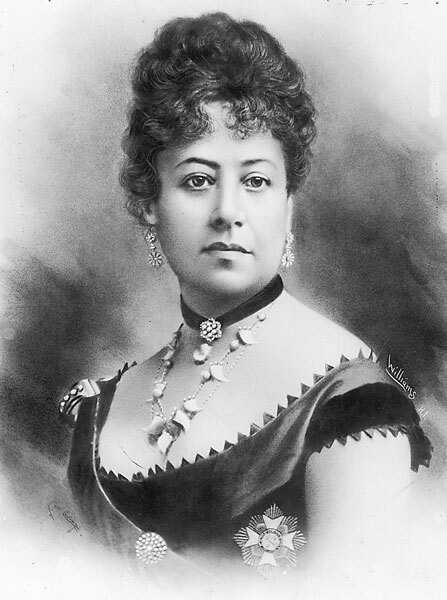 Although she campaigned actively, she lost the throne to David Kalākaua. Politics was not her strong suit — humanitarianism was. Queen Emma was much loved by the people and hundreds of mele have been composed in her honor. Her humanitarian efforts set an example for Hawaii’s royal legacy of charitable bequests. After her death on April 25, 1885 at age 49, she was given a royal funeral and laid to rest in Mauna ʻAla beside her husband and son.